Forgotten Tales hails from Quebec City, Quebec, Canada and was originally formed in 1999 as a female vocalist fronted tribute band playing European power metal with the goal of introducing Canadians to a style of metal that has been popular for years in Europe but has only recently began to catch on in Canada and the rest of North America. This is due mostly to a lack of promotion and availability of many of the best releases in the genre. Being a Canadian myself, I've had to rely on the internet and the many great mail-order sites to get the best power metal releases but things are looking up as many of the larger CD store chains are now beginning to stock the new releases by many of the more popular bands. After opening for Nightwish in Montreal, Canada in 2000, Forgotten Tales made the decision to end their days as a "tribute" band and write their own material. The band's first self-financed album The Promise, was released in 2001 and they also landed opening slots for both Edguy and Gamma Ray when they played Montreal in 2001. The Promise received very positive reviews and really helped build a local fan base for the band. This new album All The Sinners, is Forgotten Tales' second full-length release and really shows a maturity and progression in the production of the album as well as the songwriting and overall band performance. The current line-up of the band consists of Frédérick Desroches, keyboards, Cédric Prévost, drums, Sonia Pineault, vocals, Patrick Vir, bass and Martin Desharnais, guitar. 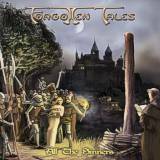 The influences of bands like Rhapsody, Stratovarius, Angra and Helloween are front and center with Forgotten Tales and the lyrics and subject matter are pure epic fantasy; a style that is so prominent amongst many of today's power metal bands. The European speedy style is prevalent through most of Forgotten Tales' music but they do mix up the tempos and styles to keep things interesting. The album begins with a 6 part epic entitled The Pagan Chronicles and gets underway with an orchestrated intro with narration before ripping into part two, The Lady Of The Forest. The speedy Euro-style double bass drum power metal jumps right out at you. The drumming is fast and tight and the overall production is much thicker and more clearer than the band's previous album. Lead vocalist Sonia Pineault has a great strong voice and unlike bands like Nightwish, she doesn't sing with an operatic style. Sounding like a cross between Lana Lane and Jutta Weinhold, she gives Forgotten Tales' music a strong character with her more "tougher" vocal style. Part three, All The Sinners has more of a Queensryche mid-tempo feel with lots of harmony guitar fills, very spirited and powerful lead guitar by Martin Desharnais and strong melodies and choruses. Part 4, Wind Oh Wind uses a power ballad style with big heavy sections alternating with quieter piano and voice passages and has solid, building melodic lead guitar with a great sing-along chorus. Part 5, The Messenger is a wild and ultra-speedy exercise that really brings the listener back to the 80's Yngwie Malmsteen Rising Force era with it's speedy scale runs but with a more thicker and modern Stratovarius tone. The Pagan Chronicles ends with part 6, March For Freedom, a speedy Freedom Call-like track with another huge chorus. The next three tracks, Three Wishes, Fairytales and My Soul sees the band still using some of the speedy elements but yet introducing more interesting and different arrangements. Three Wishes has a more "epic" Rhapsody-like feel whereas Fairytale, complete with it's Black Diamond style harpsichord intro reminds the listener of Stratovarius. My Soul has a slower plodding power ballad feel and Sonia really sings her heart out. The final track Magic Fountain, is another solid power metal song but this one suffers from a somewhat "cheesy" chorus. As a bonus track, the band has included Jeux d'enfants, a track that is recorded in French and is probably from another studio session as the production is not quite as good.